Here I have collated links to sites and resources that I find both useful and interesting. I reguarly use this page to navigate to online research sites so that I can research ancient coins before uploading them to my site. Make sure to bookmark this page as you will no dobut find it equally as useful. Please feel free to contact me if there are any sites on ancient coins or ancient history which you beleive I should add to this page. Lost the coin flip insert that arrived with your coin? Not to worry, find your coin on one of the following pages, print, cut, and insert it. Your coin will have the word "Sold" inf ront of it and will be somewhere towards the end of the catalog. This Coin Flips Insert Page is the tool that I use to print your inserts. I recommend you use high quality paper for your coin inserts. I use parchment quality paper. It looks nicer and slides more easily into your coin flip. Instructions: As your coin has been sold, it will appear with `SOLD: in front of the name. Save the page to your computer. Open the page in note pad or text editing software (in notepad, make sure to have "All Files" selected instead of "Text Documents". Find your coin in the text, then find and remove the reference to sold before the title including the following html á·…<font color="#FF0000"><b>SOLD</b></font> which precedes it. Then open the file in your browser and print. Make sure to print in landscape view. Depending on your browser you may need to adjust your margin settings. Note: the size of the tags may vary with the size and resolution of your computer screen. You may need to copy and paste the coin flip insert content into a word processing program, or save the webpage as PDF and try printing to different scales until you have a coin flip insert that is the right size for your coin flip. If you have any difficulty, email me and I will do it fo you. I can email you a word version template of any coin flip which is set to print to the right size. Geraki is a mountainside town in Greece, Sparta, where my father was born. It is a town of archelogical significance with ruins dating back to the 3rd millenium BC. The following list are my recommendations for online databases for identifying ancient coins. Online databases offer a significant advantage over physical references because they are easily searchable. Whilst physical references are helpful, they generally rely on some knowledge on the part of the reader. With online databases, no such knowledge is necessary. Identify part of the inscription, or symbol, and away you go! Wildwinds is a online reference of ancient coins. It is a highly versatile tool and is the starting point for many when researching coins online. 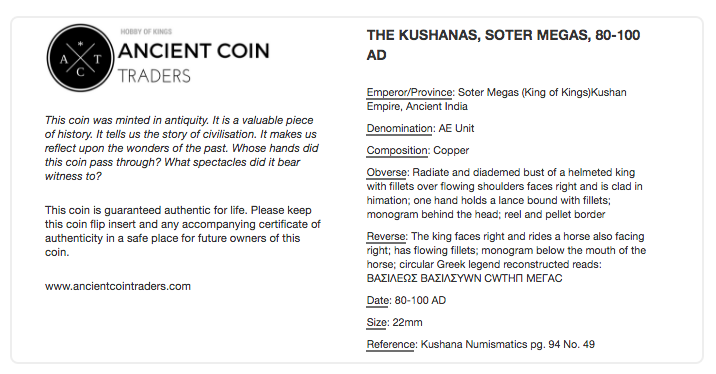 The Coin Archives is a large searchable database of coins sold at auctions. Similar to Coin Archives. Search is powerful with support for multiple languages. Search the online collection of the British Museum Catalogue. Search the entire British Museum catalogue of Roman Republican coins. Search the online colllection of ancient coins of the American Numismatic Society. Electronic database supplied by the American Numismatic Society in collaboration with the Institute for the Study of the Ancient World. Search the collection of the national library of France. Currently only in French. The national library of France, hosting the national collection of coins on its numismatic department named Département des Monnaies, Médailles et Antiques. References to all known types of the bronze coinage. This page is hosted on our website..
Search a large electronic database of ancient coins put together by over a hundred numismatists. Online database of ancient greek coins. Research site focused on Roman Provincial Coinage. Roman Provincials are particularly difficult to attribute without a good reference or search tool. Online database of oriential coins. Includes other coins such as medieval and Islamic coins. Digital version of Historia Numorum, a reference for Ancient Greek coins. Another site specialising in Roman Provincial coinage. Database of Ancient Greek and Roman coins from Asia Minor. Digital version of The Weber Collection of Greek Coins. This site focuses strictly on Ptolemaic bronze coins. Another resource for identifying late Roman bronze coins. Resource for identifying Celtic coins. This site is useful for identifying countermarks which appear on Ancient Roman coins. Search the Fitzwilliams Museum's collection of ancient coins. 540 American Numismatic Society publications are now available as full-text for free use by the public. The project Digital Library Numis (DLN) is a specialized portal and depository on open access numismatic books, journals and papers, currently available on the internet. All entries are presented with detailed bibliographic metadata, often supplemented with a brief summary of the contents. The Encyclopedia of Roman Imperial Coins (ERIC) is a comprehensive catalogue of roman imperial coins. It provides references to Mattingly H. & E. Sydenham, et al. The Roman Imperial Coinage (RIC), a handy feature for those who do not have RIC. Refer here for our review on ERIC: Ancient Coin Traders review on ERIC. Müller, L. Numismatique d'Alexandre le Grand; Appendice les monnaies de Philippe II et III, et Lysimaque. (Copenhagen, 1855-58) Volume 1. Müller, L. Numismatique d'Alexandre le Grand; Appendice les monnaies de Philippe II et III, et Lysimaque. (Copenhagen, 1855-58) Volume 2. Mionnet, T. Description de Médailles antiques grecques et romaines. (Paris, 1806-1837). Author of the Greek / Roman Coins and their Values series which are relied upon by collectors, novices and professionals as a convenient and reliable reference. For a reasonable fee Mr. Sear will assess your ancient coin and issue you with a certificate of authenticity. This service accepts almost any type of coin from collectors. Similar to Mr. Sear's service they will assess your coin, verify its authenticity and grade. I have listed discussion boards where you can participate in discussions about ancient coins with other members of the community. I post on each one of them from time to time so make sure to say hi. Discussion boards have not kept up with what the most recent social media platforms and it is no surprise that they have faced declining activity and membership in recent years. What discussions boards offer above other social media platforms is an organised searchable history of past discussions. Your starting point before asking a question is to search the board to see if someone else has asked the question previously. This is the largest discussion board on the subject of ancient coins. Expert numismatists, academics and people passionate about ancient coins frequent this forum. The discussion board has strict rules which can sometimes throw off newcomers who post without reading them - make sure you do and you will not have any issues. Another discussion board devoted to the subject of ancient coins. A discussion board covering many areas of coin collecting, including ancient coins. The ancient coins board in particular is informal and highly welcoming of newcomers. A discussion board covering many areas of coin collecting, including ancient coins. Also very informal and highly welcoming of newcomers. COINSHEET Numismatic Directory is a comprehensive worldwide resource for coin and currency related websites, which includes over 3000 listings. PE Cultural Exchange Services is a migration services provider specialising in migration pathways to Australia (including business and investment visas.